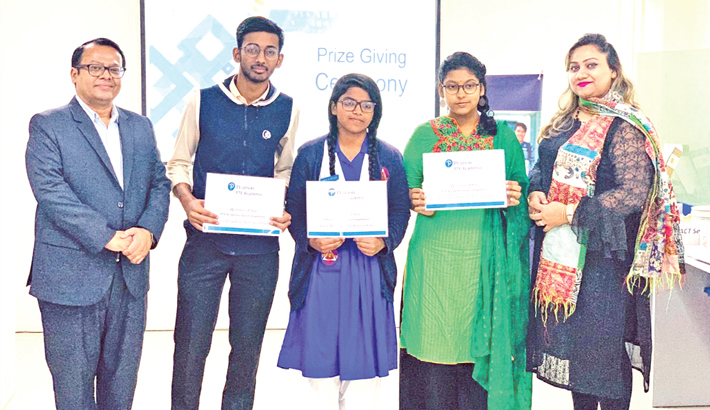 Pearson Test of English Academic (PTE Academic) awarded the winners of a quiz competition in a programme held at its Dhanmondi test centre on 27 February. Three top scorers received free scored practice test vouchers. The winners are students from different education institutions - Asif Aftab Shezan from Notre Dame College, Fatiha Ormin Naser from Shaheed Bir Uttam Lt. Anwar Girls' College and Tasfia Islam Akhi from BAF Shaheen College Dhaka. Over 200 students from 66 institutions participated in the quiz competition on PTE Academic on 21 February at Notre Dame College. Notre Dame Debating Club hosted the 30th NDDC Nationals 2019 recently and Pearson was associated with this national debate competition as a co-sponsor.